Researchers at UC Santa Barbara have developed a high-tech solution to the bane of adolescence: acne. Acne occurs when the skin's pores become clogged. Conventional remedies generally involve stripping the skin of sebum -- the waxy substance naturally produced by pores that makes your skin waterproof -- with topical washes or regulating its production with medication. However, researchers have published a novel solution in the Journal of Controlled Release, called selective photothermolysis, that relies on neither drugs nor harsh chemicals. 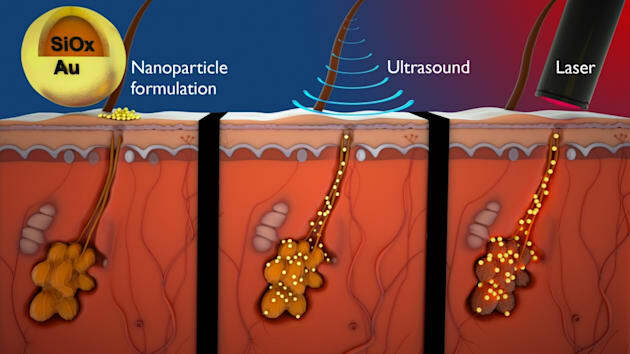 The technique delivers gold-coated silica nanoparticles subdermally (literally shoving them into the sebaceous gland using low-frequency ultrasound), then "activating" them using laser beams. "The unique thing about these particles is that when you shine a laser on them, they efficiently convert light into heat via a process called surface plasmon resonance," Samir Mitragotri, UCSB professor of chemical engineering said in a statement. The particles heat up and effectively burn out the overproductive sebaceous gland. Then they, and any excess sebum, are eventually excreted from the pore. Unlike traditional acne washes, this method doesn't irritate the skin (which itself can lead to more and worse breakouts) and, unlike medication, there's no worry about developing resistance. The treatment, which is really aimed only for severe acne cases, has already entered clinical trials though regulators still need more data on potential long-term side effects so there's no word yet on when this technology will become commercially available.